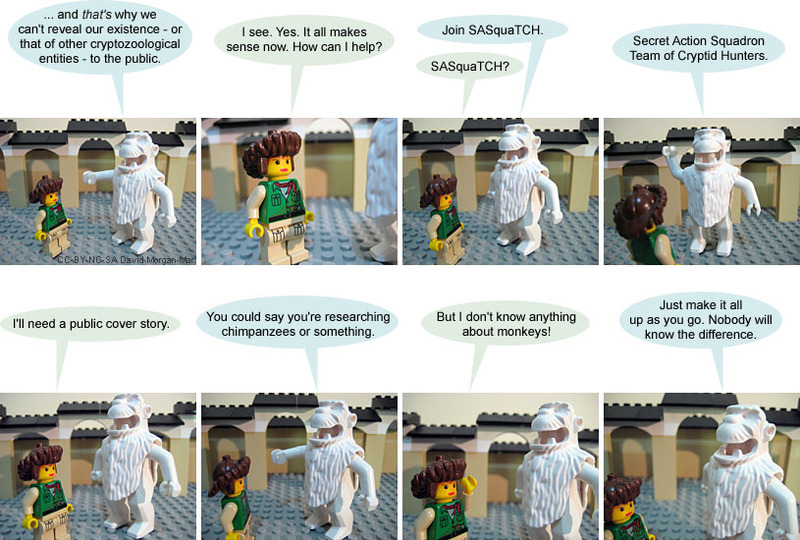 1 Yeti: ... and that's why we can't reveal our existence - or that of other cryptozoological entities - to the public. 2 Young Jane Goodall: I see. Yes. It all makes sense now. How can I help? 3 Young Jane Goodall: SASquaTCH? 4 Yeti: Secret Action Squadron Team of Cryptid Hunters. 5 Young Jane Goodall: I'll need a public cover story. 6 Yeti: You could say you're researching chimpanzees or something. 7 Young Jane Goodall: But I don't know anything about monkeys! 8 Yeti: Just make it all up as you go. Nobody will know the difference. This is how many people get through their professional lives. If you pretend you're an expert, nobody is going to disagree with you! Last Modified: Wednesday, 15 July 2009; 03:11:02 PST.